Thousands of sadhus - or holy men - have been banned from selling cannabis to festival-goers at an ancient temple in Nepal. They are gathering at Pashupatinath Temple in Kathmandu to celebrate the Hindu festival of Shivaratri. 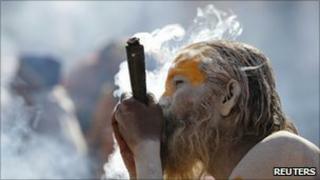 Sadhus - Hindus who renounce the world around them - traditionally celebrate Shivaratri by smoking cannabis. But those found selling drugs at the temple this year will face eviction by armed police, temple officials say. Since last week police have been mingling with the sadhus in plain clothes to identify anyone selling drugs. About 20 sadhus have already been arrested and have been moved to an area outside the city, officials say. The Hindu god Shiva is said to have enjoyed smoking cannabis. Because of that sadhus - who mostly live in forests, caves and temples - see their use of the drug as receiving a blessing from him. Thousands of sadhus have travelled from India for the festival - which falls on 2 March this year - and the temple authority has said it does not object to the sadhus smoking cannabis for their own worship. Despite this, the Pashupati Area Development Trust (PADT) wants to ensure the drug is not sold on the temple premises. "Over the past few years, the use of drugs has become more widespread and it's also become commercial," PADT Member Secretary Sushil Nahata told the BBC. "It has spoilt the essence of the festival." "We heard a lot of rumours that sadhus were selling these drugs. We tried to stop them doing this last year, but weren't able to," said Mr Nahata. "This year we've started a proper campaign." The PADT has put together a task force of 25 people, including police and armed police officers, to enforce the ban. "We have only found limited amounts of hashish in cigarettes so far," Mr Nahata said. He added: "Any sadhus arrested with large quantities of the drug will be sent to jail."